Connecticut is well-known for its role in the mass production of firearms through the genius of 19th-century pioneers like Eli Whitney, Simeon North, and Samuel Colt. But what came before the Industrial Revolution made its mark? Through the 18th century Connecticut gunsmiths like Benoni Hills of Goshen produced superb fowling long-barreled hunting guns (known as fowling pieces) that served their owners well in peace and in war. These early gunsmiths produced their weapons one at a time, mirroring the craft tradition found in furniture-, clock- and silver-making. The Connecticut Historical Society has two Connecticut-made long guns from this earlier period, the work of Harmon Deming of Canaan (1767-1840). One of these weapons, dated ca. 1805, began life as a “rifle,” that is, a long-barreled gun with spiral grooves cut into the barrel interior. “Rifling,” as this process was known, imparted a spin on the projectile which increased both range and accuracy. 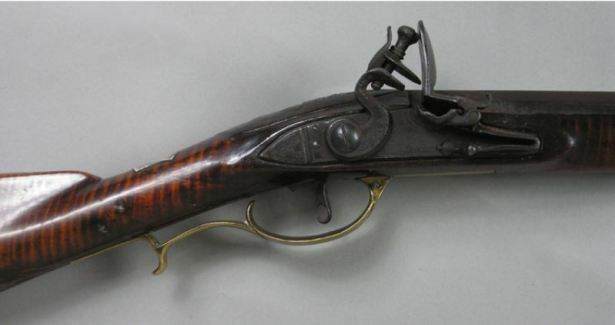 This was the epitome of high-tech firearms in the period and was very unusual in New England. Because of the similarity in design to so-called “Kentucky rifles” produced in Pennsylvania, Virginia, and adjacent frontier areas, the Deming piece was long misattributed by collectors and experts. Genealogical and historical research ultimately provided the key to identifying the “H. Deming” engraved on the piece and, by extension, its Connecticut origin. Deming’s rifle, with its beautifully engraved lock and trigger assembly (firing mechanism) and cover for the patch box (a compartment in the stock that held wadding), embodies the craftsmanship of individual Connecticut gun makers of the 1700s—before the introduction of the factory system of mass production and interchangeable parts that became so great a part of the state’s industrial legacy.